This is our first guide and letter template pack, in a series of six. It is intended to help you understand Parental Responsibility and the rights and responsibilities that come with it. In addition when you download there are 12 letters which you can adapt to use in a whole host of circumstances. Parental Responsibility (PR) is the term used to describe the rights, authority, powers, responsibilities and duties parents can have when it comes to looking after their children. * More than one person can have PR at any given time. * All adults with PR have an equal say in the child's upbringing. Do I Have a Right To Parental Responsibility? Fathers do not really have a specific right to see their children or to have PR. Instead, the law focuses on PR and the rights and duties it gives a parent. PR is a legal status that means you have a duty and the authority to look after your child. PR gives you a right to contribute towards the upbringing of your child in a safe and secure environment. If you have PR, this does not mean you can override the mother's wishes and decisions, or her right to make everyday decisions concerning the child. Mothers and fathers should try to agree on decisions regarding the child together. If major issues cannot be agreed upon, you will most likely end up in court and a judge will determine the outcome. It should be noted that once or if you have PR, you do not obtain any extra rights to see your child. In the UK, mothers always have automatic PR for their children. Fathers however, do not necessarily have PR. Married to Child's Mother: If you were married to your child's mother at the time your child was born, or you subsequently marry the mother of your child, you will automatically have acquired PR. You will not lose PR if you and your (ex) wife later divorce. Once acquired, PR is permanent. Residence Order:If you have a Residence Order determining where and with whom the child is to live with, you will automatically have acquired PR, if you do not already have it. It is not possible to have a residence order without also having PR. PR will continue until the order ceases, if it is obtained as a result of a residence order. If I don't have parental responsibility how can I get it? If you want to play an active part in the decision making throughout your child's upbringing and be entitled to help make important decisions, you can enter into a 'Parental Responsibility Agreement' with the mother. A Parental Responsibility Agreement bestows PR upon you, regardless of the fact that you are no longer in a relationship with the mother. A Parental Responsibility Agreement is a legal agreement which must be signed by both the mother and yourself. You will need to complete form CPRA (1) parental responsibility agreement (the signatures need to be filled in in black ink) before you go to court. You then need to go to your local Family Proceedings Court, County Court, or the Principal Registry of the Family Division in London, with the child's mother, so that both of your signatures can be witnessed by an authorised member of court staff. The child's mother must take along the child's full birth certificate to prove that she is her mother. Both you and the mother will also need to take photographic and signature ID, such as a passport or your full driving licence. When your completed application form has been witnessed, you have to send the original paperwork along with two photocopies to: The Principal Registry of the Family Division, First Avenue House, 42-49 High Holborn, London, WC1 6NP. Once this has been processed, you and the child's mother will each receive a sealed copy of the agreement and the original will remain at court on the court file. The agreement will take effect when it is recorded in London. You should seek legal advice from a solicitor where possible, before entering into such an agreement. If the child's mother does not agree to you having PR for the child, you could apply for a 'Parental Responsibility Order' through the courts. This order will state that a specific named person, i.e. you, have PR for your child. It is then shared between yourself and the child's mother, and any other person that has PR for your child. You will need to show that you are the child's father before PR is granted and will most likely be directed to apply for a 'declaration of parentage' to confirm that you are the father. Can I have parental responsibility for my child even if he/she does Not live with me? If you have PR, you have a right to be involved in your child's upbringing, even if he or she does not live with you anymore. Where your child lives is irrelevant to your PR status. The child's mother make the decisions regarding his or her everyday life, such as bed times, mealtimes, watching television, attendances at clubs etc and you cannot tell her how to make these more minor decisions. But for other more important things, such as which school your child goes to, what medical treatment he or she has, what religion if any they follow and so on, you have the same right to making decisions as the mother. Are there any limitations on the decisions I can make by myself? PR is shared equally between every person with PR for the child. Theoretically, an individual with PR can make decisions about the child on their own if it is necessary and reasonable, given the circumstances. Parent with day to day care, makes 'everyday' decisions: The parent with the day to day care of the child, whether this is the mother or father, will make the everyday decisions about the child, and should not be prevented from doing so by the non-resident parent. Important decisions need permission from anyone else with PR: You cannot make important decisions about the upbringing of your child without permission from all other persons with PR, unless they delegate all of their power to you. Such important decisions include changing your child's surname, consenting to their marriage or adoption, and deciding whether he or she emigrates to another country. You should consult the child's mother regarding any important decisions, in order to save recourse to the courts if / when disagreements arise. Once a decision has been made by the court, everyone with PR must do exactly what the judge has ordered and the power to make decisions for yourself will have been taken away from you. It should be noted that the court is very unlikely to want to interfere in the more minor and trivial decisions that parents should be able to agree upon between themselves. When the child is old enough to make certain decisions:As your child gets older, he or she may want to make decisions for themselves. If they have the capacity do so, your full input and PR may diminish. This does not mean that you no longer have PR, but that your child is competent to make certain decisions on their own. It is therefore important to include your child in making important decisions as they get older. If you don't and the matter ends up in court, the courts could deem the child able to make the decision without your permission if he or she fully understands the situation. Simply put, if your child is capable of consenting, they have a right to be consulted over important decisions regarding their upbringing. PR includes the right to refuse and/or consent to medical treatment for your child. However, if a doctor does not believe that the parents' decision is in the best interests of the child, he can make an application to the courts. Medical decision-making is one area that can place limits on your powers and rights. What happens if I don't agree with decisions my ex-spouse/partner is making? If you and your ex-wife or ex-partner disagree over the decisions surrounding the upbringing of your child, there are several ways of resolving them. The most cost effective and straight forward way would be to resolve the matter directly between yourselves, each explaining their views and trying to reach a mutual decision. If this does not work, you could attend mediation at a family mediation centre. Mediation is a way of resolving disputes without recourse to the courts. Typically, a mediator will help the parties to negotiate a settlement, without telling them what to do. You will maintain control of the proceedings and be able to reach a mutually satisfactory decision with your ex-partner. Mediation is completely confidential. An alternative way of resolving issues is by going to court. You can either make an application for a 'Specific Issue Order' or a 'Prohibited Steps Order'. A Specific Issue Order - allows the court to make decisions about issues that have arisen in connection with the exercise of PR. They usually relate to major aspects of a child's upbringing. A Prohibited Steps Order - allows the court to make a ruling preventing one person with PR from doing a certain thing, such as changing the child's surname without the father's permission. It would then be the case that the specific step would only be allowed to be taken with the court's permission. A specific issue order or prohibited steps order can only be made in relation to child under the age of 16 years. How long does parental responsibility last for? PR automatically comes to an end when the child reaches 18 years of age. At this point, the child will become an adult and can make their own decisions about their future. A PR Order from the court will also end automatically when the child reaches 18 years of age. If PR is given to you through the implementation of a residence order, your PR will come to an end when the residence order ends. Can my parental responsibility be taken away from me? It is extremely difficult to remove PR from a parent once they have acquired it. 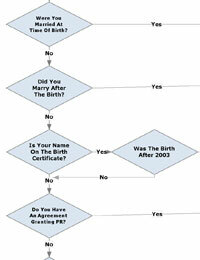 If you were unmarried and gained PR by the registration of your name as the father on your child's birth certificate, it can only be removed by a court order, a court application by another adult with PR for the child, or the child's own application if he or she is old enough to understand the proceedings and their implications. Occasionally, a PR order or parental responsibility agreement can be brought to an end by the court, but the welfare of the child will be the judge's first and foremost consideration when deciding whether to do this or not. PR is usually only removed from a parent if there is risk of serious harm or injury to the child. To accompany this guide, we have a series of letter templates for you to use. You can Download The Parental Responsibility Guide and Letters Here. We hope that we can help you in some small way with your Parental Responsibility application or questions. My ex has just got a Temporary Care Order with a PSO attached - she has lied to the court about her reasons "welfare of the kids" and this has been granted - where do I stand? I have two children for a immigrant partner that entrap me to get astay in the country. Later having Found out it all was all a plan to trap me she made somany alligation against mealmost tring to put me behind bars. The social services later found out the truth later, that she was very manpulating and abusive and decided to awording me with emergency costerdy order of the two children, which later leading her to flead away with the two children. Four years later she now challenge me with CSA And they forcing me to pay for child support for £400 every month with an area £7000 this has been going on for 7years and yet the mother would not let me to see the children or have access to them for the past 7 years. Financially am not entitled for legal aid and was told by a solicitor that it will cost me £2,500 for legal battle for the children I am just about surviving on my my monthly salary, paying for two children that I do not have a parential right to see because the mother is makingherself above the law.What can I do or where can I get help from because thisthings is affecting my health. So my partner split from the mother of his children. They have a regular agreement of when he sees them which is pretty much half the time. It works well, he's just had a huge operation and is unable to have the children for a few weeks. Now is it his responsibility to provide different childcare becuase they can't come here or is it the mother's responsibility?! The matter should be discussed and agreed between both parents. As a general rule, if the parent who usually has the children and cannot have them for any reason, that parent would take responsibility for finding alternative childcare for this interim period. There is no reason why responsibility should fall to the mother, as both parents have equal responsibility to provide for their children. Myself and my partner split up quite a long time ago we have 3 children together she has mental health issues and currently not allowing contact with the children l do have PR and now she is not sending the children to school and wants to change school for my oldest child can l stop this? You would have to challenge this either through mediation or via court. Please see link here . Hi My ex won't let me take my children out by myself i have to go to her house to see them. I pay child support which was done all out court this was agreed but she insisted me not taking the kids myself and this very stressful what can i do i don't have much money to go to court is this the only option tho. Hi, I pay maintenance which has been calculated through CMS. I have the children staying overnight two night each week and obviously that has been taken into account when working out the payments. My ex is now not letting me have the children each week. Can anyone tell me if I will have to increase my payments to her if she continues to do this? I would like my girls to get christened . My girls have a care order but live with me. The baby has no care order. Through court my husband had withdrawn all responsibility for his children. Do I by law have to inform him of my intentions to have my girls baptised? I have a Consent Order for my Daughter which states that I should pay support for her until she is 17 or leaves full time education, which ever is first.My Daughter is current studying a NVQ, NVQ's cannot be full time by there nature (vocational qualification). The Law changed recently which states that all children should be in education until the age of 18, do I still need to support my Daughter financially. My son is presently unable to make contact with his partner and baby (it's just over 2 weeks since she left). No forthcoming information is available from her family. He despartely wants to see the baby, we have had advice regarding the possibility of mediation and or failing the success of this attempt to seek alternate advise from a solicitor. However would either of these methods be useful or successful should the mother be staying in a women's refuge centre? As a grandparent my heart weighs heavy with the awfullness of the situation and the great sadness endured by the present actions of others. I would so appreciate any advice or support regarding this matter and how to deal with it in a just manner that would we all hope bring about a positive outcome. How would you deal with this situation? Would my son given these circumstances manage to achieve an amicable outcome to see his daughter in the future? Hi, my partner is currently not in contact with his child, due to the mother being in breach of a court order, and not letting him see him. We are proceeding through another court order to get contact back. In the meantime, we have contacted the school to request copy of his most recent school photographs, and they have denied him, and said he does not have parental responsibility, yet he is on his child's birth certificate named as the father, which was registered after December 2003. Which we are certain gives him PR? Do the school have the right not to let him have them? School and local authority staff must treat all parents equally, unless there is a court order limiting an individual's exercise of parental responsibility. Individuals who have parental responsibility for, or care of, a child have the same rights as natural parents; for example: •to receive information, e.g. pupil reports, to participate in statutory activities; e.g. vote in elections for parent governors, to be asked to give consent; e.g. to the child taking part in school trips and to be informed about meetings involving the child; e.g. a governors' meeting on the child's exclusion. Please see link here which will explain all you need to know. I have a court order allowing me to see my 3 children every other weekend and for a week at Christmas.They are aged 9 12 and the oldest is nearly 16. They have said they don't want to come as often amy more because they are missing out on things like football, scouts and other such activities as well as being with their friends when they are with me. Their mom says they scream and shout and don't want to come and they have told me themselves.Can I force them if I have a court order? My son lives with me and doesn't see his father on a regular basis. Can my son decide to come on holiday with me before he reaches 16 this would only be within a month of his birthday.When he is 16 years old do I need his fathers consent to take him on holiday. How much does a solicitor charge for a letter to be sent to my ex partner regarding contact with my son? You would have to consult a solicitor directly, as pricing may be different depending upon the level of the solicitor used and the specific company fees. It is highly unlikely the court would take your brother's child from him if the child is stable, happy and has a consistent upbringing. The court will always act on what it thinks is the best interests of the child and removing a child from the resident-parent is only ever done as a last resort. Could someone please help me?? I see my son every other weekend, I pay child maintenance without fail! my ex wife will not bring him to see me or pick him up. I drive 1 hour each way to collect and drop him off which is costing me a fortune and I simply can not afford the petrol money to do BOTH runs anymore. I asked for my ex wife to do 1 trip o which she has undeniably refused to do. This is now a massive problem as I will struggle to see my son no. Does she have a responsibility in ensuring my son sees me? I am desperate to see him and he loves me and cries down the phone to me asking why his mum wont bring him to see me. someone please help. If you are paying child maintenance you may be able to request a 'special expenses variation', please see link here for more information. Otherwise your only other option is to suggest mediation in order to sort the issue out, or apply to court. could someone please help me?? I see my son every other weekend, i pay child maintenance without fail! my ex wife will not bring him to see me or pick him up. i drive 1 hour each way to collect and drop him off which is costing me a fortune and i simply can not afford the petrol money to do BOTH runs anymore. i asked for my ex wife to do 1 trip o which she has undeniably refused to do. This is now a massive problem as i will struggle to see my son no.... Does she have a responsibility in ensuring my son sees me? I am desperate to see him and he loves me and cries down the phone to me asking why his mum wont bring him to see me... someone please help.. If your ex has significantly broken the order again I suggest you take the matter back to court. See link: Breach of Contact or Residence Order: What to Do, here. If it is a serious breach the court will be less lenient on her, therefore it is worth making sure your access is secured. If you can't afford the legal fees you can self-litigate, please see link here. Many fathers are having a good amount of success this way, if they prepare their cases well. Rather than keeping your child against the wishes of your ex (which can backfire) I would take the legal route. The fact your ex has continued to flout the terms of the order wont be looked upon lightly in court, this is why you should attempt to once again have the order enforced. Make sure you log every breach of the order and research your case well. Our forum may help as a good support network for you, as many dads may have been through the same, so can advise. I shall also put your question on our Separated Dads Facebook page, and our dads may be able to give you some further advice, so please access the page for answers. Hi, I have done everything to accommodate my ex's need and always had to do things her way just to make it easier to see my son. I am limited to sit in her parents back room whilst constantly watched and judged. She won't allow me to take him for a walk but she wants to take him away on holiday for two weeks. I'm sure I have rights to take him out as she takes him out all the time and isn't breastfeeding so nothing stopping me. As a father do I have rights to do so. You have rights as a father yes, but if the mother will not allow you to take your son out, then you would have to apply through the courts to let the court decide. Please see page: Contact Orders: the Process, here. The courts do want fathers to have a good relationship with their children, so therefore it is worth taking this route, and once the court issues a court order, your ex will have to abide by its terms. Regardless of his background and history, he can take you to court for access. If you have decided to keep your address from your ex so he cannot locate you, the court can put a trace on you. However, this does not mean your ex will find out your address, you can apply for this to remain confidential. It just means it allows the court to find you child's/childrens' whereabouts so he can apply to the courts. Whether future access is allowed or not by the judge, every father has the right to apply for it.